This is neat. 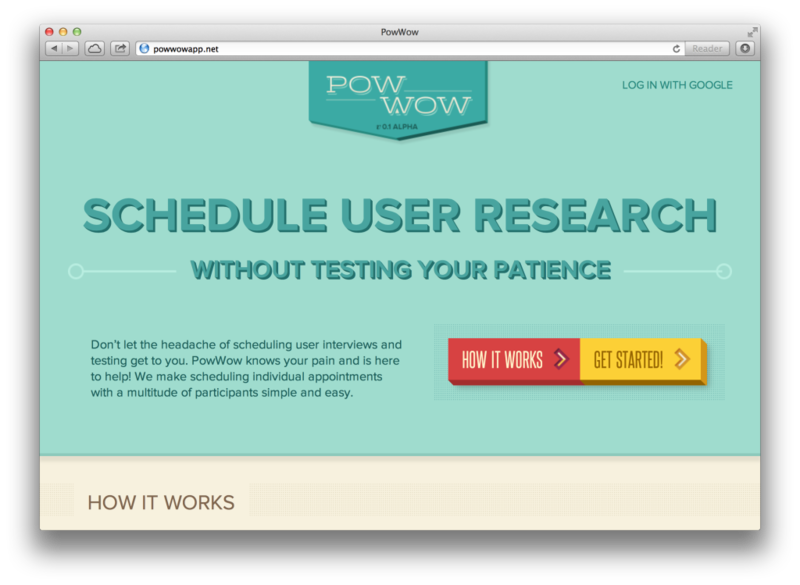 Powwowapp is free little app to help you schedule research appointments. If you work in a UX agency then you’re probably used to paying about £70-£100 a head finders fee for some recruiter to trawl their database and make a few calls. It’s worth it if you’ve got a tough screener spec, but the rest of the time you’ve got to wonder if your cash is being well spent. With Powwowapp you hook it up to your Google calendar, create your empty slots and you’re given a public facing URL for you to share. People can then pick a slot, book themselves in and give their details, which appear directly in your calendar. The neat thing is that the participants don’t get to see any other entries in the calendar, nor any of the other participant’s details. I imagine it would work pretty well in combination with a targeted mailshot (if your client has an established user base), a targeted ad campaign, social media or a combination of all of them. It doesn’t give you the ability to pre-screen the participants (i.e. have them fill in a form and prevent them from signing up if they aren’t suitable), but you can achieve that with a bit of Wufoo magic if you need it. Powwowapp was made by Viget as a side project to scratch their own itch. It is in alpha but it seems pretty solid to me. The real downside is that without a revenue model or any explicit commitment to running it long term, I’d be reluctant to use it on a big client project. With a bit of support from the UX community, I’m sure they might give it some more attention – why not drop them a line to show your support. Thanks for using and writing about PowWow. I’m glad you find it as useful as we do. As you point out, we built it to scratch our own itch, but we’d love for more people to use it. I understand your hesitation about using it on a big client. It’s not a core part of our business – yet. That said, we’re proud of the project and we’re committed to it being successful long-term. We will happily work with you and others to figure out how to make that possible. Phase 1 is simply getting it out there and gathering feedback. If that goes well, Phase 2 will likely be some kind of reasonable pricing model and corresponding support/stability commitment. Either way, it works well now and is cheap to keep it running as-is, so at the very least that should happen for the foreseeable future. Very interesting concept! One of the biggest pains of scheduling multiple clients via email is giving a list of options and then watching two or three pick the exact same time slot. I’m excited to pass this by my team to see if we can give it a whirl. Are you in a teflon-coated UX role?